Beer-battered kielbasa at Tower Hill Brewery, 237 W. Butler Ave., Chalfont. Tower Hill Brewery, 237 W. Butler Ave., Chalfont, 4-6:30 p.m. Wednesday-Sunday. Fancy? Nope. Chef Stan Kreft’s brewpub occupies a slot in a Central Bucks strip mall on Business 202. Brewing goes on right behind the bar, where you can scope out the seven varieties on the tap list, which recently included cherry pie cider and a lovely breakfast stout on nitro, all $6 a pint. Flights are recommended. 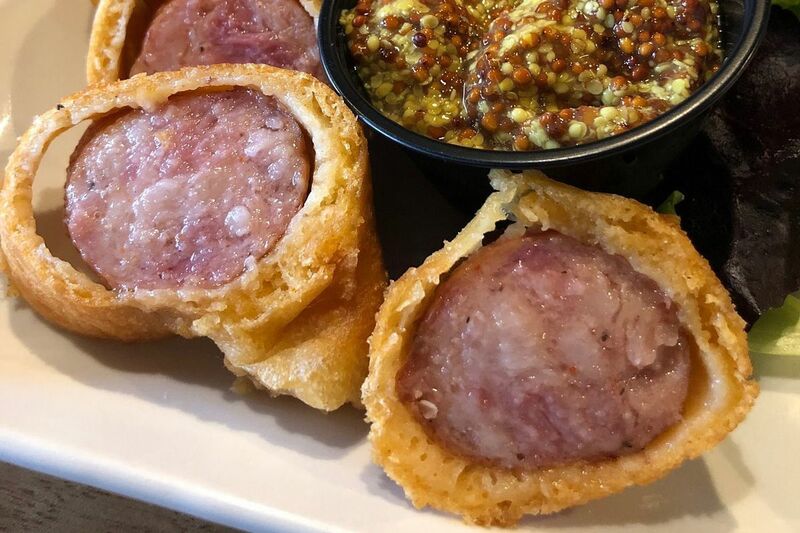 Happy hour brings certain apps at half-price, including French onion soup, vegetarian wings, panko-crusted mozzarella, and crunchy-crusted beer-battered kielbasa that will put your notions of bready corn dogs to shame. Pints are $2 off then, too. It’s open from 4 p.m. Wednesday-Friday, from noon Saturday, and from 11 a.m. Sunday.